We all know that VW group chose electrification as a way to redeem itself for Dieselgate. 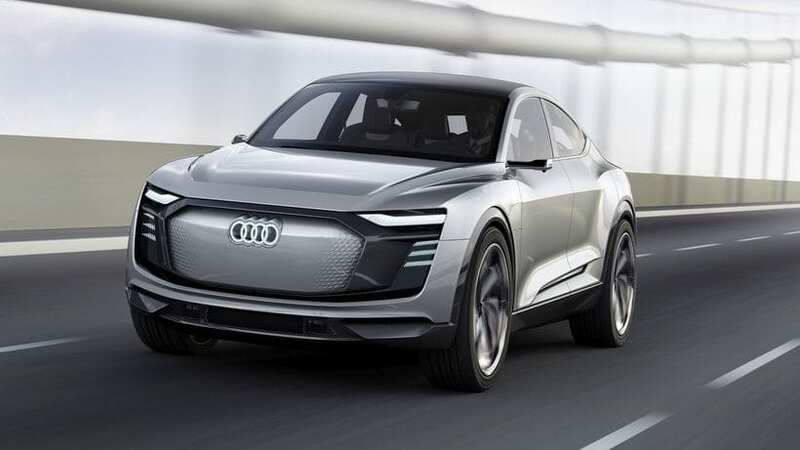 Things are starting to develop into that direction, and Shangai Auto Show was used for presentation of another step on the mentioned path in the form of 2017 Audi E-Tron Sportback Concept, which is an evolution of 2015 E-Tron Quattro concept. 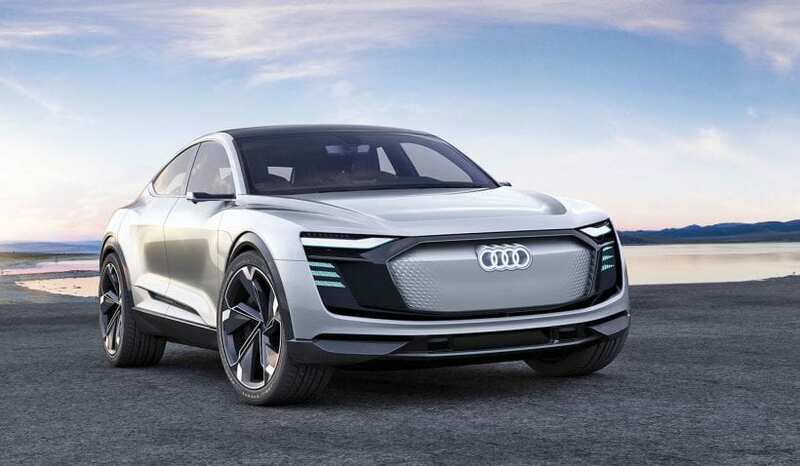 Further to everything, Audi’s chairman of the board of the directors Rupert Sadler stated that first electric car is going to hit the roads next year, while a total of five e-tron models are expected to arrive in the next five years. Let’s see then what Ingolstadt’s future holds. 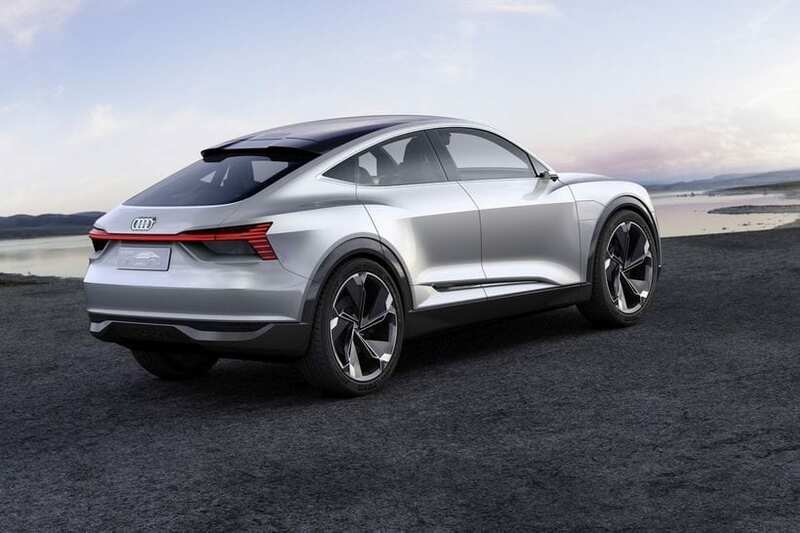 Audi finally left some breathing space for its designers with this concept. Hood is very interestingly curved, Matrix headlights are thin exposed units, and single frame grille is large plastic surface. Remember that that type of grille is actually possible in reality since electric cars don’t need air to feed the engine. Audi is a long time all about the lights, and same goes for this case, where the bunch of matrix and LED lights can put quite a show with myriads or peculiar patterns and motions. Fastback body shape with an incredibly sloped roof is appealing, and we know that incline harsh as that is too much for reality, but new Q8 could learn at least a bit of it, especially when it intends to rival BMW X6. The whole shape of rear end resembles A7 model, and now we can see that it can actually work on SUV body. The cabin is a showcase of screens, and Audi is currently already half way there. At this moment we have the Virtual cockpit, and we know that upcoming A8 is about to debut with haptic screens, probably covering much of the dash and lower console as in newest Panamera, also finally bringing touch technology to infotainment system, something that Germans for a long time were refusing to do. The whole interior design is clean and elegant but also asymmetric in some bothering way, and we hope it won’t spoil area in which Audi traditionally shines. Mentioned rakish roof left no head space at the back as we can see, plus the separate chairs are also not likely to find their way into the production model. Or the skin more precisely. There we have three electric motors, two at the back, with total power output of 430 hp or even 500 hp when boost mode is activated. That is enough for reaching 60 mph in 4.5 seconds, far behind what Tesla Model X can do in highest iterations, but still very respectable. Driving range is at very good 310 miles made possible by 95 kWh liquid cooled lithium-ion battery pack stacked under the cabin. The positioning of the battery guarantee lower center of gravity which highly improves maneuvering abilities, and it is joined by sport-tuned air suspension which allows 2.5-inch of travel. 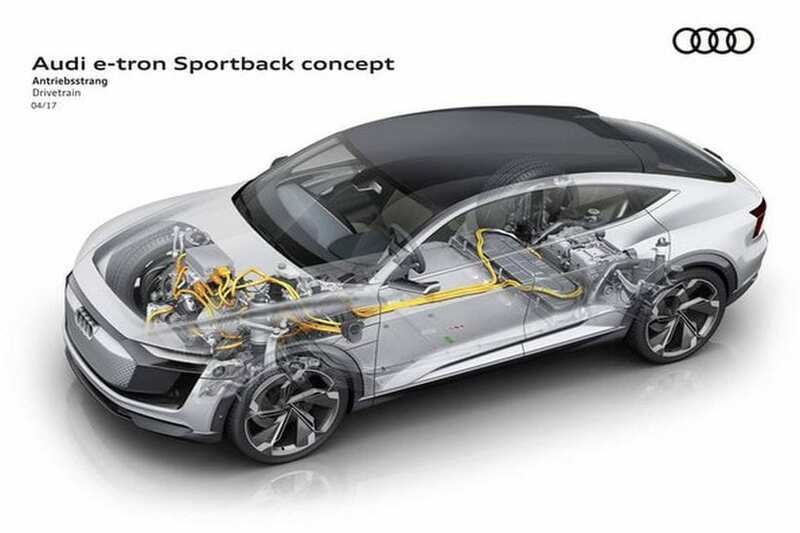 2017 Audi E-Tron Sportback Concept is an important signal of brand’s future dedication to electrified SUVs. Tesla Model X is a great seller, and it doesn’t have any direct rival since Kia Soul EV is kind of different type of beast which also sells pretty well. We obviously have plenty of space for other brands and Jaguar is evidently heading there with I-Pace, so this is the right time to join the game before things get crowded in the future.